Provide comfort for the family of Victoria Sellers with a meaningful gesture of sympathy. 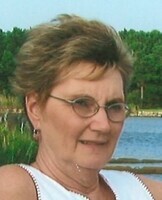 Victoria “Vickie” M. Sellers, 72, of Bellefonte, passed away on Tuesday, January 15, 2019, at home surrounded by her family. Born in Bellefonte, on January 7, 1947, she was the daughter of Edward McNichol, who survives at home in Bellefonte, and the late Norma (Hopple) McNichol. Vickie was a graduate of Bellefonte High School. She attended beauty college in New York. She worked as a beautician for Vincent Laposata until he retired. She then bought his beauty shop and continued to run it for seven years. Most recently, she was a beautician at the Mount Nittany Residence until her retirement. In addition to her father, Vickie is survived by two sons, Edward Ranio (Kristine), and Jason Ranio (Shannon); and three grandchildren, Shane Ranio, Tanisha Ranio, and Olivia Ranio. Also surviving are three sisters, Barbara Catherman, Kate Washburn, and Kris Matson. Vickie loved spending time with her grandchildren. She enjoyed cooking. She was very outgoing and especially looked forward to the times she spent traveling and vacationing with “the girls,” Barb Dolan, Melissa Fulton, Glenda Zook, Bonnie Leathers, and Judy Mitchell. She will be remembered by her vibrant personality and all the precious memories that she leaves her loved ones. A Celebration of life will be held at a later date in the Spring. Services will be announced closer to time of service in the newspaper. Arrangements are under the direction of Wetzler Funeral Service, Inc. in Bellefonte. In lieu of flowers, memorial contributions may be made in Vickie’s memory to St. Jude Children’s Research Hospital at 501 St. Jude Place, Memphis, TN 38105 or www.stjude.org. To send flowers in memory of Victoria M. Sellers, please visit our Heartfelt Sympathies Store. There will be a Celebration of Life announced at a later date in the Spring. Provide comfort for the family of Victoria M. Sellers by sending flowers. I met Vickie in the eight grade and we became lifelong friends. She was smart, brave, funny and kind then and remained that way always. Although I left Bellefonte decades ago, any trip home to visit my parents included a visit with Vickie. In later years it was fun to meet up with the “Bellefonte Girls” for trips to London, LasVegas, New York and especially Cambridge, Maryland. We enjoyed a lot of laughter through the years! My sincere condolences to Vickie’s sons, dad, and sisters. Vickie was one of a kind and will be missed by many. Barb I just learned of your sister Vickie’s passing and I wanted to tell how sorry I am for you and your family’s loss. I remember her in high school and I always admired her joyful spirit and humor. Vickie graduated with my sister and I can remember a few antics they participated in. My sister has been gone for almost 15 years so I understand how you must be feeling. I will pray for you and your family that your memories will help you to heal. Vicky became a friend back in the 90,s.She did my Mother's hair at Mt Nittany Residences for years, Mother loved her style.She and her Dad Ed did some local craft shows and helped me get started doing craft shows too.Her Dad made a blanket chest and had me paint many scenes and objects on it. All Vicky,s favorite things and places, he gave to her on her birthday.A few years ago we discovered we were both living in the Bellefonte Graystone apartment building, after not seeing each other for years. She shared her family news and her love of her kids and grandchildren, and her trips with her friends.She had such a strong, positive attitude on life, through all the years of her illness. A Great Positive Spirit ! 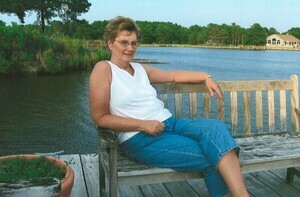 Vickie was my dear friend who shared the love of cooking, baking, Hallmark and Lifetime movies and magazines. I would share my magazines with her and then she would take them to her beauty shop for the "ladies" to enjoy. I am blessed to be one of the "Bellefonte Girls" who have shared so many good times together. We have so many memories of the wonderful trips and places we visited. Lots of laughs, some at my expense, but out of love. It is hard to believe she is gone but we will never forget her and the courage she had to fight the cancer that would take her away from her family and friends. It was an honor to be your friend. Hugs Forever! Thank you to Vickie's family for making me feel like I was part of their extended family. Vickie and I have been best friends since 3rd grade. We could only think of two times we ever had a disagreement. And, to be honest, we never could remember what it was about! I already miss our daily phone call. The "Bellefonte Girls" will never forget her courage and attitude towards life. Heaven just received a beautiful angel .